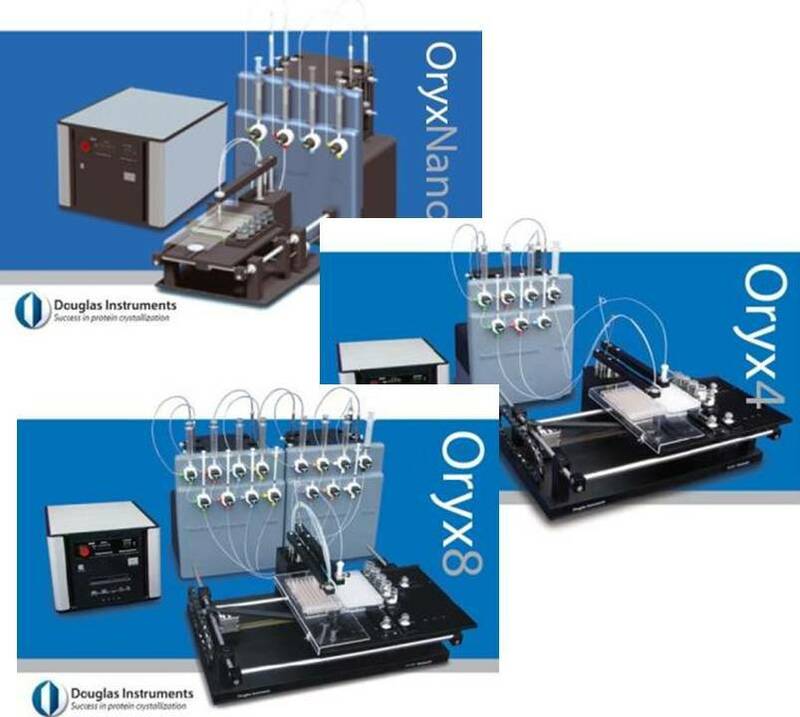 Douglas Instruments has released new software and hardware for automatic 24-well cover slide dispensing. 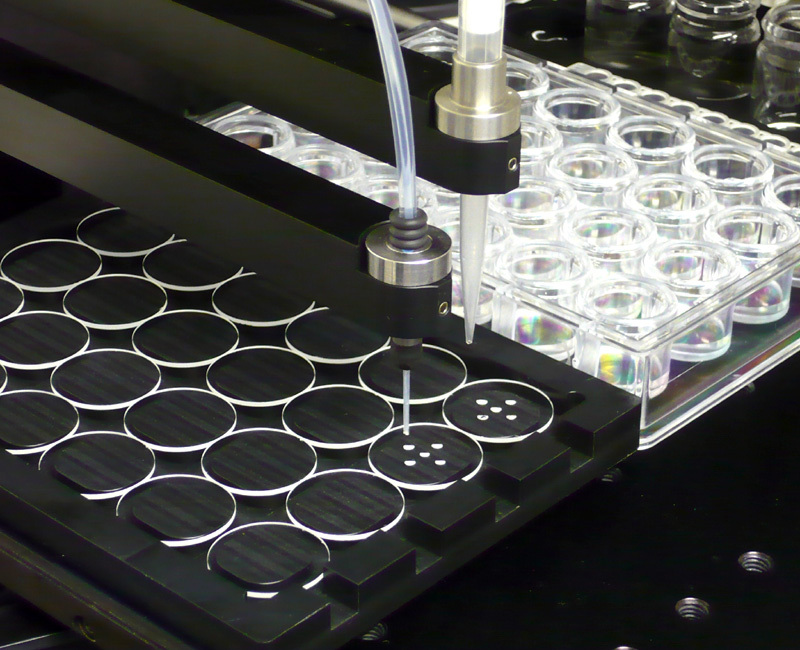 The new method can dispense up to 5 drops per slide, making it easy to adjust the ratio of protein and reservoir solution in the drops, and to add e.g. seed stock or additive. You can quickly set up powerful experiments that would take too long to do by hand. 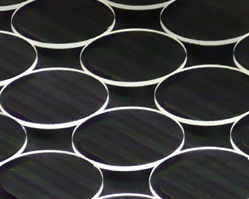 The XStep optimization software also enables users to fill the reservoirs of the source plate. This makes creating PEG vs pH grids and multivariate optimization designs simple. The system can then dispense the drops. Compatible with both thick and thin cover slides. Use with our existing XStep software to create targeted screens or multivariate optimizations - in up to 7 dimensions! Oryx4 can dispense up to 3 ingredients per drop; Oryx8 can dispense up to 7 ingredients. If you set up your initial screens with 100 nl (protein) + 100 nl (reservoir solution) drops, it's quite likely that you will have to scale up to larger drops in order to get crystals that are large enough to collect data from. If you take the same solutions and simply increase the volume to say 1 + 1 µl, you will often get precipitation instead of crystallization. This is a counterintuitive result because people correctly believe that the smaller drops will dry out more quickly, and they therefore assume that they will see more precipitation in the smaller drops. 1. The surface area to volume ratio is greater for the smaller drops (to put it another way, more of the small drop is close to the surface). 2. The smaller drops equilibrate with the reservoir more quickly. Read more about Scaling up on our website….